Make it a holiday to remember! The holidays are a special time for friends and family to come together and enjoy beautiful outdoor Florida. Hunting opportunities abound this time of year. See what seasons are open and make plans today to go hunting. Woodcock season is open through Jan. 31. Chronic wasting disease (CWD) has been found in 10 deer from western Tennessee, making it the 26th state to be affected by CWD. CWD, a contagious neurological disease that causes deer to die, has not been detected in Florida. Hunters are an important ally in preventing CWD from entering Florida. 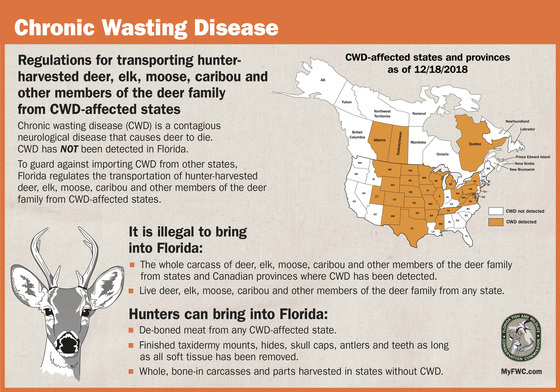 To guard against importing CWD from other states, hunters should abide by the regulations outlined below that govern the transportation of hunter-harvested deer, elk, moose, caribou and other members of the deer family from CWD-affected states. Also, the FWC asks anyone who sees a sick, abnormally thin deer or finds a deer dead from unknown causes call the toll-free CWD hotline, 866-CWD-WATCH (866-293-9282) to report the location of the animal. Wood ducks begin nesting as early as January in Florida, so now is a great time to build and place wood duck nest boxes. Also, don’t forget to check and repair existing wood duck nest boxes and predator guards and replace nesting material as needed. 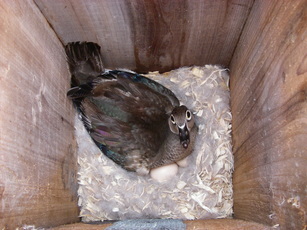 Learn more about wood duck nest boxes. Wood ducks typically nest in natural tree cavities, but these may be in short supply in some areas. Providing nest boxes can support the local population of these beautiful birds while providing opportunities for wildlife viewing. 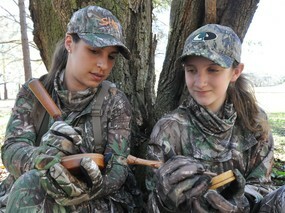 Know a young person who wants to learn to hunt? 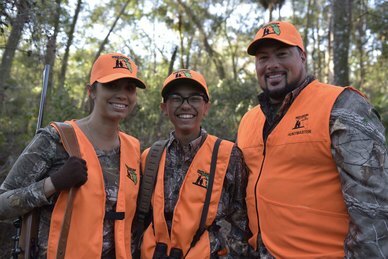 The Youth Hunting Program offers safe, educational, mentored hunts for youth who may not otherwise have a chance to experience hunting. These organized hunts provide opportunities to learn about conservation and gain new outdoor skills. Hunts for deer, turkey, wild hogs, small game and more are available for youth between 12 and 17 years old who have passed a hunter safety course and are accompanied by a parent or guardian. Volunteers provide places to hunt, meals and mentors at these family-oriented events. Visit the Youth Hunting Program event calendar and sign up for a hunt today! 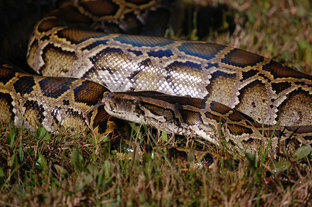 If you’re enjoying the outdoors around the Everglades ecosystem in south Florida this winter, be on the lookout for opportunities to safely remove pythons from the wild. This nonnative species can be killed on private lands at any time with landowner permission. No permit is required. You also can lethally remove nonnative reptiles from 22 FWC-managed public lands without a license or permit. Learn more about python removal.